Some mail days are better than others. Am I right? These days it's usually junk or a bill... or junk disguised as a bill. But, this particular mail day happened to be the BEST mail day ever, when a gorgeous blendtec Designer 725 blender arrived on my doorstep! Their packaging kind of says it all: "You're about to look, feel, and live better." I would like all of those things, yes. It is unassuming, but super powerful. The blades are not uber sharp, and yet they've creating some magical technology that makes it blend everything perfectly smooth! I love that it has easy-to-use presets for things like: smoothie, soup, salsa, and juice. Its illuminated capacitive touch screen gives you encouraging messages like "let's get healthy" and "Good work today!" It is easy to clean with its own cleaning cycle, so the blender cleans itself. 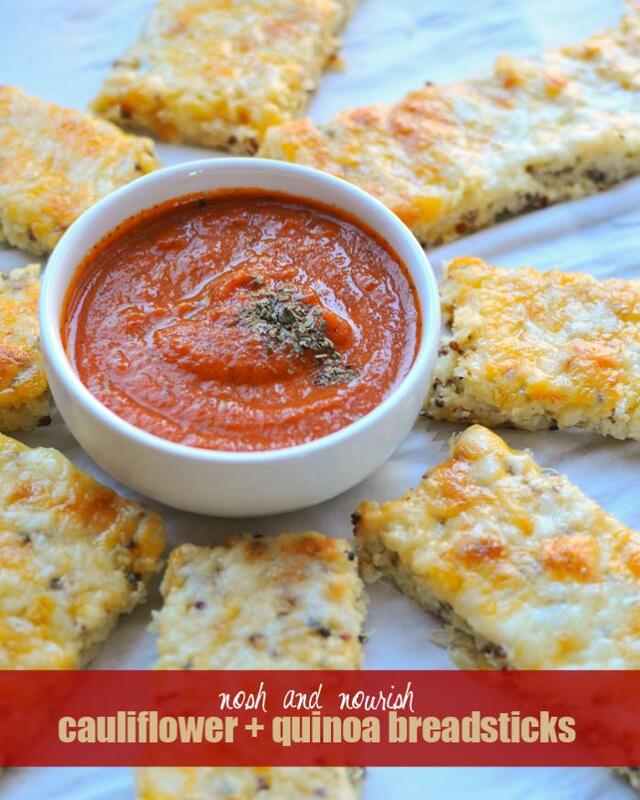 I used the blendtec twice in this recipe -- to finely chop the cauliflower and to puree a homemade marinara sauce. It handled both jobs effortlessly. 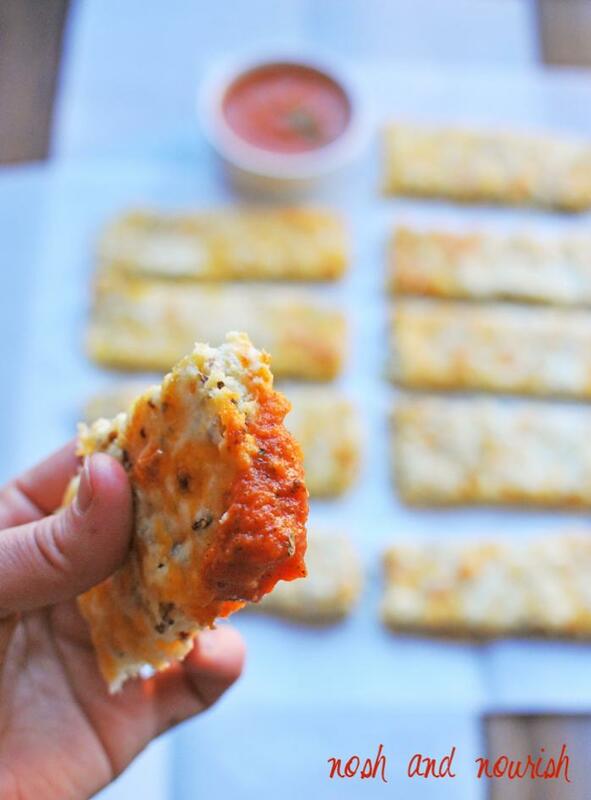 These pizza sticks are pimarily made up of cooked cauliflower, eggs, cooked quinoa, and dry quinoa flour (to keep it entirely gluten-free and add another boost of protein)... but you could sub regular flour if you prefer! I've made them a couple times already, they're so good! And if you have sensitivities to dairy like I do, you can sub in Daiya mozzarella shreds to keep it dairy-free! All that's left is to take a bite (and go shopping for the ingredients!). This post is sponsored by FitFluential LLC on behalf of Blendtec. The opinions, text, unique recipe, and beautiful photos are all mine. Thank you for supporting brands that support Nosh and Nourish!! I choose them based on what I already cook/create with and feel 100% confident in recommending to you. Finely chop a head of cauliflower in a blender (or a food processor will work too). I did about 1/4 of the cauliflower at a time. Put the chopped cauliflower into a square 9x9 glass pan that is microwaveable. Do not add water. 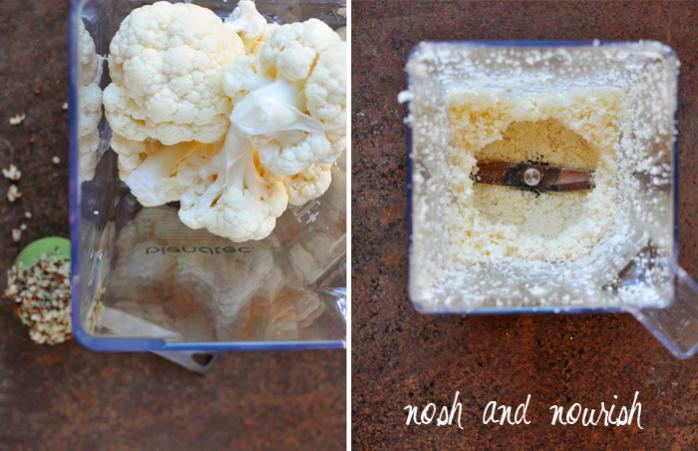 Let the cauliflower cool for about 10 minutes. Spoon a large scoop of the cooked cauliflower into a cotton tea towel. And squeeze out as much liquid/water as you can. Warning -- the liquid will be hot! Be careful. Continue this process until all of the cauiliflower is squeezed. In a large mixing bowl, combine the squeezed cauliflower, the quinoa, the quinoa flour, the eggs, 1 cup of cheese, and all of the spices. Stir thoroughly. On a parchment-lined baking sheet, press the cauiliflower mixture into a flat even rectangle. Bake for 35 minutes, until the top and edges are starting to get golden brown. 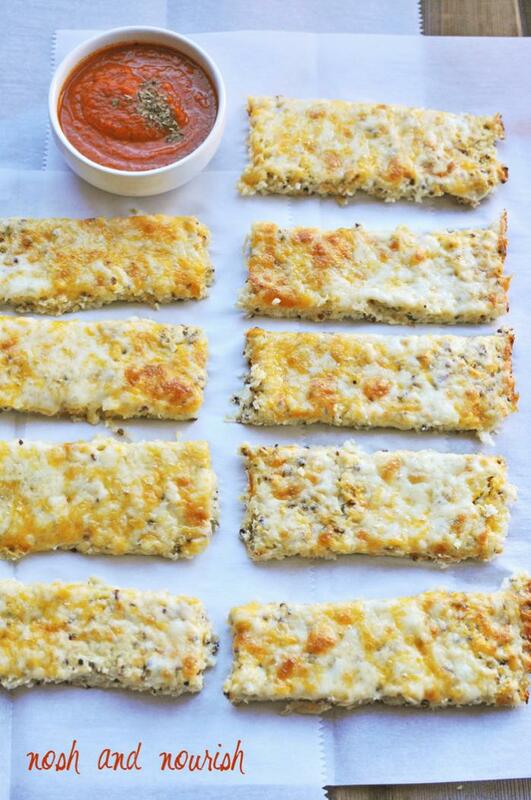 Take it out of the oven and top it with the remaining cheese. Then bake it for an additional 8 minutes, until cheese is melted and bubbling. Cut it into sticks, and serve hot with warmed marinara. In a small saucepan over medium-low heat, heat up the sauce. Stir frequently so that it doesn't boil / make a mess! 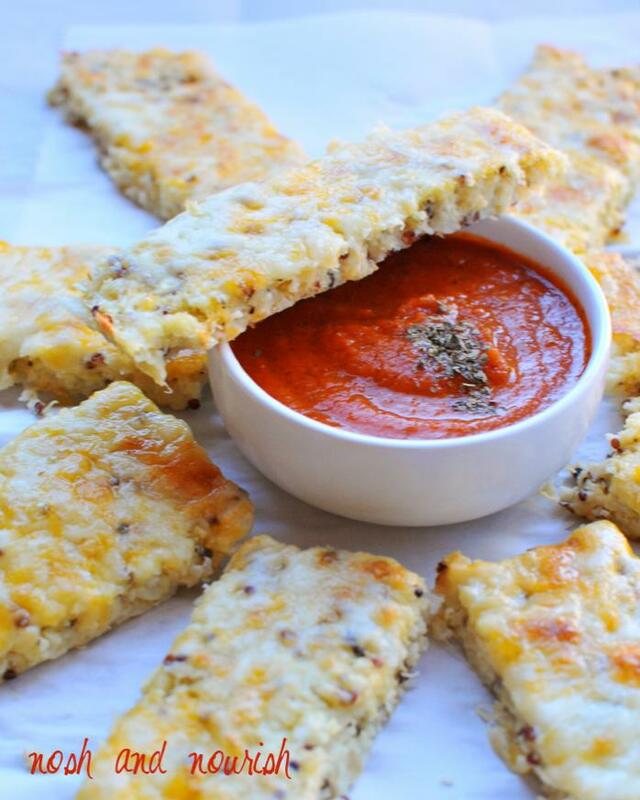 Enjoy with the cauliflower breadsticks.